Light is for any photographer, a fascinating environment. I'm not the only one who is amazed at how a picture is composed and broken down, so I decided to try to understand more closely what happens in a camera. 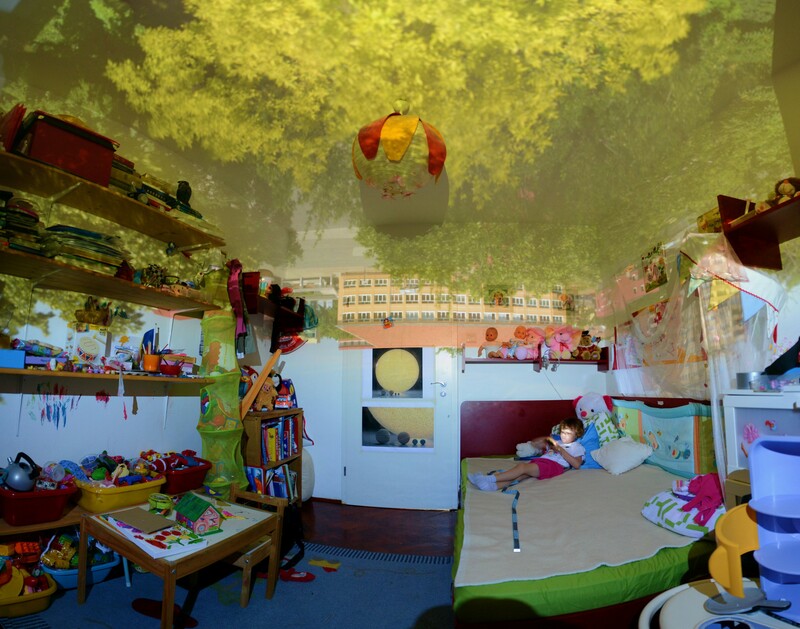 Last year, I had the opportunity to experiment direct with light, when I made a darkroom in my daughter's room. The pinhole I realized it was bigger than the one prescribed by the formula, namely about 10 mm diameter, thus obtaining a sufficient brightness for me to orient the room. Swiping my fingers over the pinhole I was amazed how the image is "curving" on the crossing of my hand over the small hole. The entire projection "danced" at a rate corresponding to the movements of my hand, I being the one controlling the bending of light rays. 1. the deviation from the rectilinear propagation of light waves, sound or radio waves etc. at the encounter of an obstacle, at the passing through an aperture or adjacent to the edge of an object, propagating behind them. The above are the premises from which I started looking for a different understanding of the phenomena happening inside the cameras I build. Light and the two duplicitous models we have to understand it - particle and wave - always fascinated me. Somehow I have the impression, based on discussions with friends regarding rendering softwares I use professionally, as well as their own subjective judgments, that the understanding of light as particles prevail among the great majority of us. 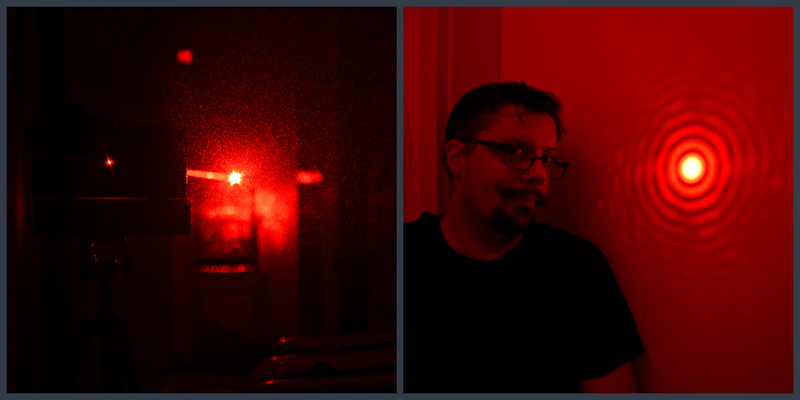 So a few weeks ago, during a quiet weekend, I turned my home into a small lab and I experimented with the pinholes I have available now. 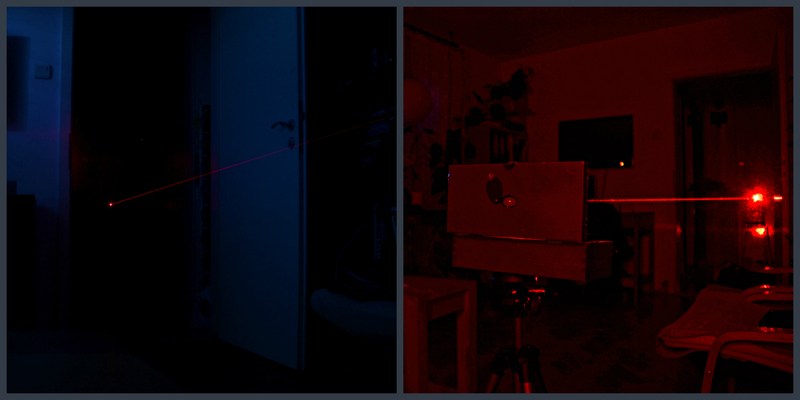 Along with a red laser (650nm, 5mw), drawn blinds and a set of mirrors I witnessed what the behavior of light as wave means. As I read in books and seen in presentations, the pinhole perimeter generated diffraction which has led to a pattern of different luminous intensity, as expected. Expectations are one thing yet the effect of this experiment on me was completely different! For the first time I had the opportunity to see the diffraction pattern generated by an almost ordinary light source, and a pinhole created by me! The understanding and most of all the seeing the duality of light I mentioned earlier, has been a revelation. In the next posts I will present what I could witness by letting light pass through a slit (in relation to my latest pinhole camera) or through various pinholes manufactured by myself and others. For the comparison various pinholes click here.